I first read this when I was in high school. I'm fairly certain I bought it on a family vacation, so it was fitting to reread this while on vacation. 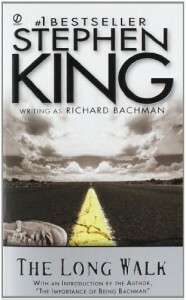 What I liked: This was the only "Bachman" book I read by Stephen King and has always been on of my favorites. I'm not sure why this was, maybe because the protagonists (and really, all the characters) were teenage boys. So as a teenage girl...it was just a little too appealing to slip into a boys mind. Even if it was overcrowded by pure terror. I also think it was my favorite because it was such a simple, yet complex story. I still feel that way today. It's short, it has few major characters, yet, it is absolutely horrifying. What I don't like: I'm hard pressed to name something I don't like about The Long Walk. I guess it's a bit disappointing that King never wrote more stories like The Long Walk, but then again, maybe the other Bachman books have a similar feel to them. I wish I hadn't taken so long to reread this book.